Sarah Palin stands ready to stump for Republican gubernatorial candidates, but neither Chris Christie nor Bob McDonnell seems to want her help. Given her loyal following among many in the party’s grassroots, it’s Palin who could surely draw the largest crowd and perhaps raise the most money for the two candidates—her book, “Going Rogue,” is already the number-one bestseller on Amazon, over a month before it’s even released. Neither GOP campaign wanted to discuss why they didn’t want Palin in the state—to say so would offend the conservative base that both Christie and McDonnell are counting on, not just to vote for them but to also volunteer time in the crucial final weeks of the election. Former U.S. vice presidential nominee Sarah Palin, holding a local newspaper with her picture printed on, arrives at the check-in counter at Hong Kong airport Thursday, Sept. 24, 2009 as Palin is leaving Hong Kong for the U.S.
Ex-Gov. Sarah Palin made a decorous debut on the international stage Wednesday with a long speech to investors in Hong Kong. As politicians like ex-President George W. Bush prefer when they leave public office, the event was closed to the evil, distorting media that’s probably too cheap to buy a ticket anyway. And as with teenage dating, there’s nothing the pursuer wants more than something he can’t have. So, of course, some details always leak out. Palin was reportedly well-received and folksy at times, but gone was any hard-edged partisanship so familiar from the campaign a year ago. She did not mention what’s-his-name in the White House who clobbered her Republican presidential ticket last November. 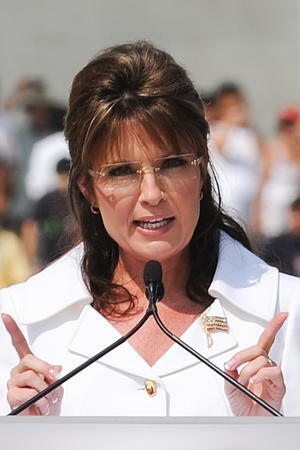 Palin Goes To Hong Kong…What Will She Say? Yep, you heard that right: former Alaska Gov. Sarah Palin will travel to Hong Kong for her first commercial speaking engagement, a keynote address at the CLSA Investors’ Forum September 23. Given that foreign policy was a soft spot for Palin during the 2008 campaign, this will give her a chance to boost her foreign policy cred (and she’ll be able to see Taiwan from her hotel room). It could also boost her business cred, while she’s at it, depending on what her speech focuses on…”Our keynote speakers are notable luminaries who often address topics that go beyond traditional finance such as geopolitics,” a CLSA spokeswoman said in a statement. Past luminaries include Bill Clinton, Al Gore, and Alan Greenspan. CLSA, the company with the 'Opening Doors' policy, will close media access during Sarah Palin's CLSA Investor Forum keynote speech on September 23, 2009. Quick: what do Sarah Palin, Bill Clinton, and Archbishop Desmond Tutu have in common? Quite possibly nothing right now. But come Sept. 23, if all goes according to plan, all three will have been keynote speakers at the annual CLSA Investors’ Forum in Hong Kong. Op-Ed: How Much has Palin Damaged McCain? The Political Cortex published a insightful op-ed today on how shortsighted the selection of Alaska Governor Saray Palin as the Republican vice presidential candidate has been for the GOP and the possible long term damage Gov. Palin has inflicted on Senator John McCain. The Republican right proceeds at blinding speed to commit political suicide. During an era when things so frequently went their way within the national political power structure, aided in no small part by a mainstream media that so often looked the other way or approved of atrocious electioneering and policymaking, right wing Republicans began to believe that power should be theirs, particularly the presidency, for the eternal taking.